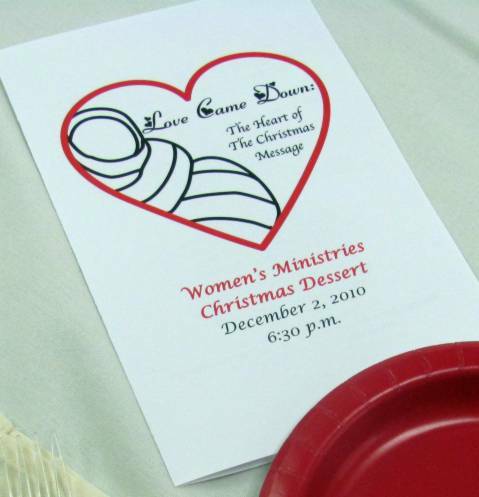 Today's entry encompasses a wide range of things that I did for our Women's Ministries Christmas Dessert the first week of December. 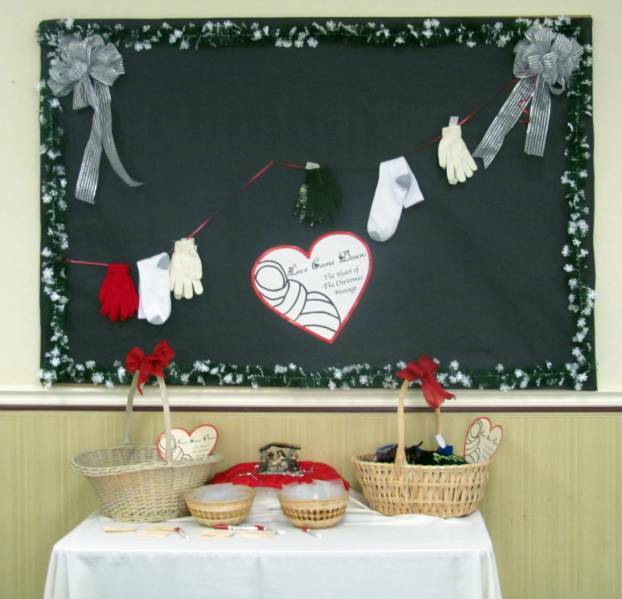 I was the chair of the program committee, suggested the theme, drew the logo, wrote the program, arranged for the people who would perform the program, designed the nametags, suggested the service project, designed wall decorations, and directed the napkin folding. These are all things I would like to share with you. If you would like to present this program with your group, there is no copyright to my script and I welcome you to use it. The logo is also available for your use. These were used on the advertising, the tickets, the programs and were enlarged to hang from fishing line from the ceilings in the hall. Group Singing: What Child is This? Here He is, our sacred sign. Soloist sings: Mary Did You Know? That I love Him every day! Thank God for reminding us of his love and for providing a way for us. Ask for tender hearts to receive him. 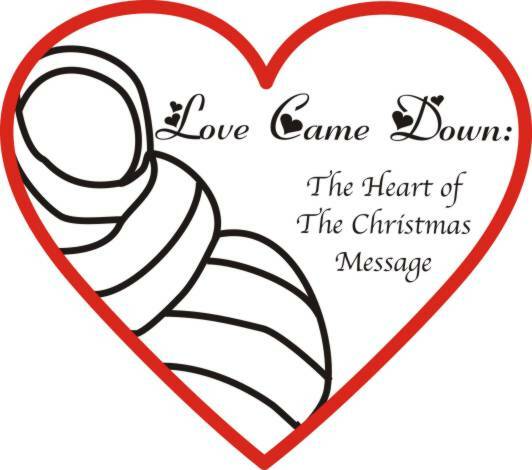 Ask for courage to share the good news as we go into the Christmas season. Pray God’s blessing and peace on each person in attendance. M.C. : Thanks those who presented the program and offers a closing prayer. (sorry fror the formatting problems of my blog editor)You can see in the narration that the name tags read. “For God so loved NAME that he gave his one and only Son, that if she believes in him she shall not perish but have eternal life.” We left a space for them to write in their own name and these were slipped into pin-on holders. After the program the ladies could slip out their name tag for use as a bookmark reminder. Because we were focusing on the nativity several people brought theirs for table centerpieces. I designed huge silhouettes using black roll paper. I drew them, other ladies cut them out, and groups of us hung them on the walls. We used the area above the chair rail so people in the room would not block the view of them. The palm trees are 7 foot tall. These are stuck up with blue painters tape rolled up on the back. If you look closely you will see that the baby in the manger and the star are made from white posterboard that has been spray painted gold. Also, look up! There are four angels mounted on the ceiling over the nativity. 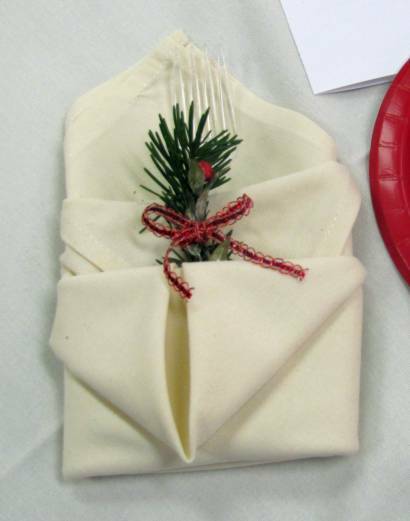 Then on the day we decorated I directed napkin folding to contain the forks and a sprig of greenery tied with a red ribbon. So that's the whole of it. As I said, you are welcome to use any of these ideas for your own event. If you can use the artwork and want it in a format you can use, please email me and include your own email address (I cannot reply to you if you use the 'comments' for your request. Although the title of today's entry is "A Song With No Tune" I should say that it really DOES have a tune...but just in my head! This is a poem/song that I've been working on over the last week and it is done - except I don't write music. He lived that I might die to sin. "All glory to the Lamb." His mercy, love and sacrifice. My prayer - to be his own delight. His grace rests ever on me. All glory to the Lamb! His comfort sent in love . I taste the goodness of the Lord. and drinking in his great reward. His spirit feeds me daily.